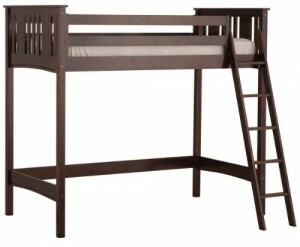 Give your tween their own personal getaway with the Canwood Base Camp Loft Bed; a place to relax and unwind. The Canwood Base Camp Loft Bed, with its mix of rustic and traditional design elements, is great for saving space in your tween’s room. Add a coordinating Canwood dresser or armoire under the bunk or make it a comfortable spot for homework by adding the Canwood desk and hutch. Or expand your sleeping space by adding a matching Canwood twin size bed underneath. This elegantly designed loft bed creates a strong, striking statement ideal for that traditional styled bedroom, with its solid sought-after New Zealand pine construction. All Canwood beds are designed with security in mind; unique metal-to-metal fastening systems, employed for all connections, together with a sturdy fastened ladder and full length guardrails. You can sleep well knowing you have a Canwood bunk bed. Complete your Canwood bedroom look by adding an assortment of matching modern designed accessories: a night table, chest, dresser, armoire, desk, hutch or bookcase. Canwood Furniture will not be a passing fad, nor is it finished in a color which will quickly be out of fashion. The Canwood look is timeless. It is always in style.